Ceiling track systems use slings similar to the slings used in conventional floor models but that's where the similarities end. Ceiling track systems arepermanently installed in homes and institutions and consist of lift motor which travels along a track mounted to the ceiling. A strap descends from the lift motor to a sling cradle which the lift sling is attached. When the switch for the lift is activated the strap travels up and down, raising and lowering the sling and patient. There are several makes and models of ceiling track systems but, as with the floor lifts, slings from one manufacturer should not be used on lifts by a different manufacturer. Because use of the ceiling track lift is limited to the areas directly below where the track has been installed, users don't enjoy quite as much versatility as those who use floor lifts. One might wonder why anyone would choose such a system which doesn't seem to be as versatile as a floor lift, but the fact is, the ceiling track lifts will work in areas that can't be accessed by floor lifts such as small bathrooms and congested sick rooms. In order for the ceiling lift to be functional, the layout of the track is very important and if the installer isn't experienced or the layout hasn't been predetermined by someone who is experienced, the user won't ge the full benefit of the lift. Floor lifts are quite large and storage is often an issue, but ceiling lifts don't take up any floor space and the unit is usually stored at the end of the track which is normally out of the way near a wall. To transfer a patient, the caregiver uses a sling to lift the patient into the air, propels the patient along the track and lowers them in the desired location. Track can be located in one room or all through the house depending on the needs of the user but ceiling track lifts are usually found in the bathroom and/or bedroom. There are generally two configurations of ceiling track systems. The first is a lift system where the lift motor is permanently attached to the track. The permanent type lift is most often used where the ceiling track is installed throughout the house and through a variety of connectors, carousels, and joints the lift can be moved to every place in the house where transfers need to be performed. While all ceiling track systems use an electric motor to lift and lower the patient, most manufacturers offer a unit which has a second motor which will power the unit along the track. The power traversing unit is helpful for situations where the caregiver is unable for some reason to propel the patient along the track or where the patient them self want to propel themselves. In some cases some patients are able to put on their own slings, lift themselves and propel themselves making their transfers totally independent with a power traversing ceiling track system. The second configurations is the portable ceiling track system. 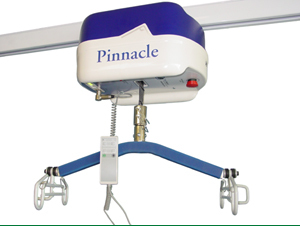 With the portable ceiling track patient lift, the lift motor is suspended from a wheeled carriage which travels along a track mounted on the ceiling. The big advantage of this system is that the lift motor can be moved from one track to another. In a typical installation a length of track is installed in the bedroom for transfers into and out of bed or on and off a commode and a second length of track is installed in the bathroom for transfers to and from the toilet, bathtub or shower chair. The patient can be transferred to their wheelchair or wheeled commode in their bedroom, the lift disconnected, the lift and patient wheeled to the bathroom, the lift connected to the bathroom track, and then the patient is transferred to the toilet or bath tub. The lift motor for the portable ceiling track lift is a little more expensive than the unit which is permanently attached to the track but the costs of installing the track is substantially lower if transfers are required in more than one room. For those who have a second home, cottage or frequently visit friends or relatives, a piece of track can be installed fairly cheaply in the place where the patient is visiting. 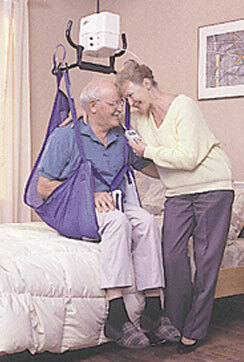 The lift motor and sling are taken along by the patient when traveling from one location to another. This may sound like a lot of work but the portable lift motor can be disconnected from the track in seconds and is smaller and lighter than a full size loaded suitcase.